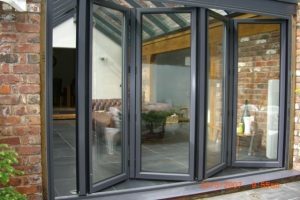 Aluminium is fast becoming the preferred choice for windows and doors not only for commercial applications, but increasingly within the domestic arena! This is no surprise to the team at First Choice H&P Ltd, who have an in depth knowledge of this versatile material, after many years in the industry. The fact that it’s low density means that it can be used to design ultra slimline profiles while retaining its strength is just one exceptional feature. The possibilities of this have not escaped architects and designers alike, who use aluminium’s flexible nature to realise many ambitious building projects. The uniquely sleek and attractive look offered by this type of window and door profile is ideal for commercial applications. It enables businesses to present an extremely impressive and professional looking façade for their premises. Thermal efficiency – Some glazing specialists like First Choice H&P, offer an insulating polyamide thermal break to separate the inside and outside profiles, blocking cold air from entering the home. Security – State of the art locking systems are incorporated in high quality products. Design choice – Extremely strong, meaning very slim profiles and unusual shapes if desired. Colour range – Available in a wide choice of attractive RAL powder coated colours. Long life – Durable and lasting for a practical home glazing solution. Weather resistance – Keeping rain and wind on the outside is what these products are good at. Glazing options – Choose which type of glazing you prefer. Lots of light – A wide expanse of glass means lots of light coming into the home. Choice of configurations – Window types include Tilt and turn and top swing, doors come as bi-fold or sliding/folding. Recyclable – Aluminium is an eco-friendly product and can be recycled time and again.